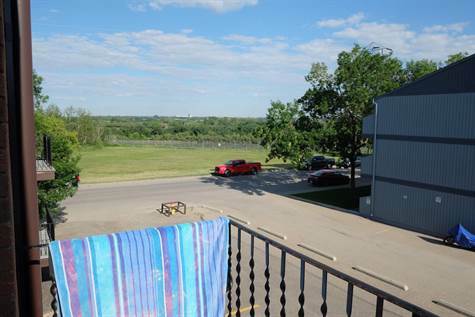 Bright and affordable 2 bedroom top floor condo across the street from the river. Modern trim and kitchen with large windows and views of the river from the bedrooms and balcony. Updated building and suite includes tile backsplash in the kitchen, tiled tub surround, white trim and doors, in-suite laundry plus a shared laundry room in the basement. Fiber optics with SaskTel infiNET run to the suite. Unit is family owned and shows pride in ownership. Quick possession is available. One parking stall is included and is located right next to the back door. Only utility you pay is electricity. 9 parks within walking distance including Diefenbaker Park, Gabriel Dumont Park, Prairieland Exhibition, public transit, Western Development Museum, and Circle Drive. Great location to get around the city, airport and out of town quickly.